Since long before our founding as a nation, Canada has long struggled to reconcile between two distinct halves: one English, one French. In the last half century especially, there’s been an on-again, off-again desire among some in the province of Quebec to separate from the rest of Canada. 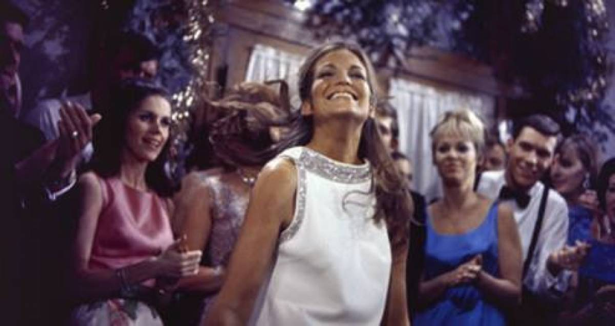 Even before the Parti Québécois was formed for this purpose in 1968, Canadian filmmakers were beginning to explore this subject matter in works such as 1967’s Waiting for Caroline. Young anglophone Caroline (Alexandra Stewart) is cozying up to her francophone squeeze Marc (Francois Tassé) during a brisk winter in picturesque Québec City when old flame Peter (Robert Howay) arrives to heat things up. Still not over their college fling, Peter has come determined to convince Caroline to marry him. But before anything can be settled, she is summoned home to Vancouver to attend the wedding of her father Stephen (William Needles) to the much-younger Emily (Sharon Acker). Still torn between two suitors from very different places, Caroline takes a gamble by inviting Marc to return to BC with her and Peter. Any hopes of a swift resolution to her dilemma begin to slip away as she is forced to confront shifting circumstances and the evolving culture of the late 1960s which may prove her circumstances to be unreconcilable. Waiting for Carolineis a romantic triangle that owes a debt to French new wave classic Jules & Jim(any doubt of it’s influence is silenced by a prominent poster for the film in Caroline’s apartment!). For being produced in a time when most early Canadian filmmakers were immersed in the documentary-esque cinema vérité style, this work is significantly more restrained with it’s lush colour cinematography deftly showing off it’s Quebec and BC settings. I just wish the story was as enjoyable as the visuals. The film had a promising opportunity to set it’s love triangle against the never-ending tension between two Canadas, but director Ron Kelly fails to utilize this in any meaningful way. Other than Caroline being given the cold shoulder by several Quebecois early on, there’s never really a sense of the divide between the two cultures. Despite solid introductions, the characters of Peter and Marc never really develop into anything worth attention to. Are these bores really worth fretting over? It doesn’t help that the entire runtime is consistently punctuated by an ear-splitting harpsichord score that honestly makes you wonder if the soundtrack got switched with a 17thcentury costume drama during mixing. The mid-late 1960s were generally a horrible time for film scores and this soundtrack only furthers that reputation. Cinematography aside, the only real saving grace here is the breathtaking Alexandra Stewart who effortlessly commands every frame she’s in. Her portrayal of a young woman struggling between competing identities of a wealthy west coast heiress vs. A new age bohemian add much needed depth to the lacklustre storyline. I can’t help but think this story could have been better realized post-FLQ crisis where it’s themes would have registered even stronger. As it stands, Waiting for Carolineis pretty to look at, but rather hard on the ears and not really worth the time it takes to unspool. Waiting for Caroline screened as part of “The Image Before Us: A History of Film in British Columbia” series currently ongoing at the Pacific Cinematheque in Vancouver.